Happy 4th of July to all my American readers. 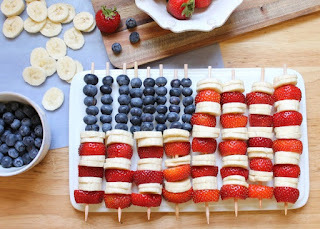 These bright and delicious fruit skewers were inspired by the American flag and are super easy to make. Try the simple recipe below to make a patriotic treat perfect for Independence Day. 1.) Rinse and dry berries. Chop the stems off strawberries, then cut into halves from stem to point. Cut the point off strawberries and set aside. 2.) Slice bananas and set aside. 3.) In a bowl, mix water and lemon juice, then place banana slices in lemon water and coat both sides to prevent browning. 4.) Starting with the blueberries, skewer about six on top and alternate between two banana slices and one strawberry slice until you reach the end. 5.) Place on a platter and keep refrigerated until serving.